A family from Leland, North Carolina was on vacation away from home when their house caught fire this past Saturday evening. 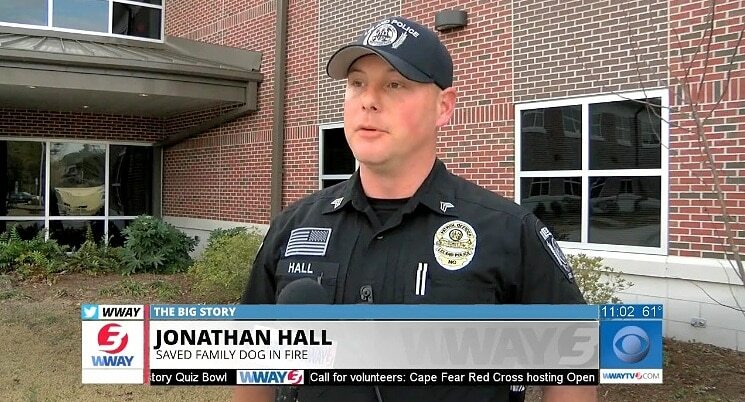 Off-duty Leland Police Officer Jonathan Hall, whom is also a neighbor, noticed this and immediately thought of the family’s dog trapped inside. Without any hesitation, he burst in through the front door of the burning house and rescued her. Hall searched the entirety of the Davidson family home while the house blazed away. He went outside to grab a breath of fresh air, and that’s right when he saw Kia running straight at him and the door he had just kicked open to try to save her. Kia managed to get out and away from the burning building, and Hall immediately got himself out and away to safety as well. Other neighbors in the small community are hailing Hall as a hero. However, when asked about it he just expressed that he partly just understood what he did as his sworn duty, and he also did it in the hopes that if his house had caught fire while he was away from home, that someone would do exactly the same thing in turn. The homes that were adjoining the Davidson’s home were also damaged in the blaze, and investigators are calling the home a total loss. Single dad John and his eight-year-old daughter Hali have lost all of their material possessions, their home and unfortunately some fish and a hermit crab. Many of the Davidson’s neighbors have been pitching in to help them out. They’ve been collecting donations for them of all sorts; food, clothing, cash, basically anything they can get their hands on to do whatever they can to help. Both Hall and Porthier say that the neighborhood is pretty tight-knit any no one wants to see any of the other families have to go through something like this. Anyone wishing to make a donation can contact Paige Saburn at 910-619-0088 or Kelly Brantley at 910-620-9644. You can also make a donation via GoFundMe by clicking here.